This entry was posted on October 12, 2013 by Dan H..
Finding creative bulletin board ideas for fall can be a little daunting. You don’t want to do the same old thing nor do you want to have a similar board like another teacher. Going the simple route for fall ideas maybe just what you need since the autumn months are nestled between back to school and Christmas. 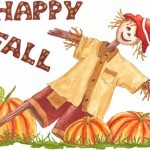 What better way to add color to your classroom in the fall than by using fall related items. Apples, pumpkins, scarecrows, and brightly colored leaves are all the ingredients to having a beautiful bulletin board. These are just a few ideas that are colorful and easy to create. A quick and easy board related to reading could be one with a tree holding a book with a sign below stating “Fall into a good book”. Use colorful leaves and give the tree personality by adding white and black circles for eyes and place them above the book. A bulletin board decorated with a squirrel and some acorns with the title “Nutty About Science” or whatever subject you choose is an easy idea. Place a book in the squirrel’s hands titled A Squirrel’s Guide to Science or other subject. A scarecrow sitting on a wooden fence made from crinkled paper with crows, ears of corn and pumpkins is an idea that would be easy to create. The title of the board “We’ve Got Lots to Crow About!” would allow students to add a little touch to the board with what they are excited about being added to the corn and pumpkins. Apples and baskets below a tree with a few falling leaves and the title “Learning is Bushels of Fun” will bring apple picking time and fall together. For younger grades, a bulletin board with a tree and colorful leaves with the students name and/or picture with the title “Our Class is TREEmendous!” would be something easy and cute. A plain scarecrow placed in a pumpkin patch with a few crows and the title “First Grade is Something to Crow About” is a super easy idea for a board. “Kindergarten is Stuffed With Fun” is a quick bulletin board idea. Using a picture of the face of students and wallpaper with raffia to make scarecrows with a few pumpkins placed around the board would be quite cute and simple. For a physical education board, a 3D cornucopia wrapped with leafy vines, filled with soft balls and the title “We’re Having a Ball This Fall in Physical Education” is an eye-catching bulletin board. A “For All This, We Give Thanks” board is an easy idea that will encourage older students to think about what they are truly thankful for. Quotes pertaining to being thankful can be printed on colored cardstock and placed in random places on the board. Have students write on leaf, pumpkin, and turkey shapes and place on bulletin board. An owl, tree and leaves would make an easy “Let’s Have a Hoot This Fall” board. This board could work for both lower and upper grade classes. A “Give People Something to Be Thankful For...You!” board is an easy idea. Using a turkey with different character traits as tail feathers with random placed leaves and ears of corn is an idea that can be used for either lower and upper grades. “Gobble Up Good Grammar” is another idea that can be used for another subject. Using a turkey and different colored tail feathers with grammar rules and other subject related ideas can be simple and yet a teaching tool. Bulletin board ideas for fall can be simple but yet effective.